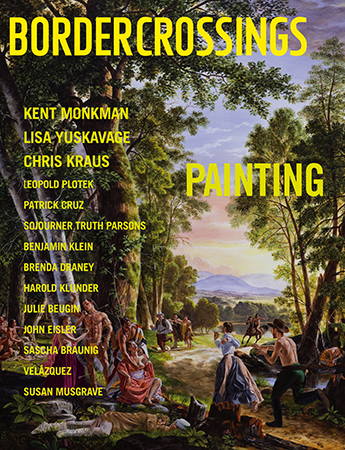 Border Crossings’ issue on Painting is our most widely anticipated issue of the year. We have been present over the years to witness the predicted demise and rebirth of the medium. Today painting exhibits a new sense of experimental freedom. In this issue we talk with two artists who look to history to structure the endeavours of their conceptual pursuits. For Canada’s 150th birthday, we mark the complicated anniversary with an in-depth interview with Indigenous artist Kent Monkman. Monkman, of Cree and Irish ancestry, works in a variety of media from painting, film and video work, to installation. By reimagining and recasting Canada’s historical narrative, Monkman subverts the Eurocentic straight gaze and authorizes an experience largely expunged from the canon of art history. Through the use of his primary character, Miss Chief Eagle Testickle, Monkman cleverly poses some challenging philosophical questions. How do Canadians reconcile their own history with its colonial past? And how do we reform the structures of that inequitable system that remain in place today? In our interviews, Border Crossings also features the work of New York-based artist, Lisa Yuskavage. Yuskavage played an influential role in the establishment of a new genre of figuration. Her figures are voluptuous and encompass a complete cast of edge-dwellers and outsiders. Yuskavage utilizes a spectrum of historical techniques from imprimatura (underpainting) to grisaille to cangiantismo (a rainbow colour effect) that created the quality of the supernatural in the works of the old masters. Yuskavage asserts that making art is a form of protest against what has already existed while simultaneously embracing vestiges of the past. In this issue we also feature interviews with six young contemporary artists who all employ paint as their primary artistic medium. We look at Toronto-based artist Patrick Cruz, Brenda Draney who lives in Edmonton, Benjamin Klein from Montreal, Los Angeles-based Sojourner Truth-Parsons, Julie Beugin in Berlin, and John Eisler in Toronto. In our articles, James D. Campbell discusses episodic voyeurism in the art of Harold Klunder, Benjamin Klein looks at the experimental and improvisational elements in the word of Leopold Plotek, and John Kissick takes a sideways look at two portrait exhibitions featuring New York-based, young Canadian artist Sascha Braunig and Diego Velazquez in, Looking in Your Eyes and Seeing Nothing. We feature a Borderview with the legendary Chris Kraus who has just released her book called After Kathy Acker: A Literary Biography published by Semiotext(e). A full online edition of the interview can be found on the Border Crossings website. Border Crossings Crossovers include reviews on Canadian-born Shannon Bool, Brazillian artist Lygia Pape, Nunavut artist Itee Pootoogook, Italian sculptor Marisa Merz, Algerian Abdel Abdessemed, a review of the Vollard Suite, Picasso: Man and Beast at the Winnipeg Art Gallery and much much more.